This model is valid CellML. However the model will not run in either OpenCell or COR and the model requires further curation. ABSTRACT: The possible effects of intracellular Ca2+ on the pacemaker of the heart, the sinoatrial node, are reviewed. In mammalian sinoatrial node, reduction or abolition of the intracellular Ca2+ transient by ryanodine, sarcoplasmic reticulum Ca2+ pump block or 1,2-bis(2-aminophenoxy)ethane-N, N, N', N'-tetraacetic acid (BAPTA) reduces the spontaneous rate by 21-32%, whereas in amphibian sinus venosus it abolishes spontaneous activity. In rabbit sinoatrial node, ryanodine/BAPTA reduces the T-type Ca2+ current (iCa,T), perhaps slows inactivation of the L-type Ca2+ current (iCa,L), reduces the inward Na+-Ca2+ exchange current (iNaCa), and reduces the rapid and slow delayed rectifier K+ currents (iK,r and iK,s, respectively). Other evidence shows that a reduction of intracellular Ca2+ inhibits the hyperpolarization-activated current (if). These putative intracellular Ca2+-dependent changes in ionic currents have been incorporated into different models of rabbit sinoatrial node action potentials. In the models, block of the Ca2+ transient reduced the spontaneous rate by 24 and 26% in the central and peripheral models of Zhang and others, 13% in the Oxsoft model (Noble et al. ), 9% in the model of Wilders and others, and 41% in the model of Demir and others. In all models, the reduction in rate was not primarily the result of the decrease in iNaCa, but instead the combination of all changes in ionic currents. Control of the pacemaker activity of the sinoatrial node by intracellular Ca2+. Experiments and modelling, M.R. Boyett, H. Zhang, A. Garny and A.V. Holden, 2001, Phil. Trans. R. Soc. Lond. A., 359, 1091-1110. (note there is no PubMed ID for this publication). 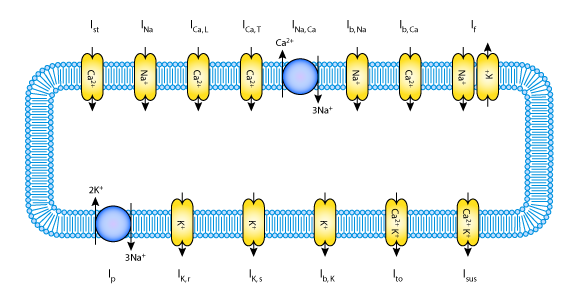 A schematic diagram describing the current flows across the cell membrane that are captured in the Boyett et al 2001 model of the action potentials in the peripheral cells of the SA node. Derived from workspace Boyett, Zhang, Garny, Holden, 2001 at changeset 59fbbebd0c49.